qualified, friendly teams in the area. 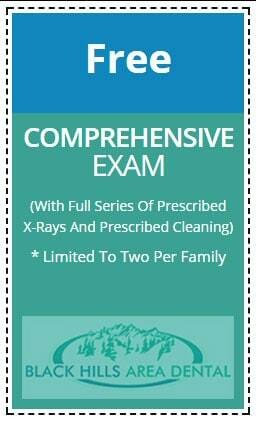 Ask us about our free comprehensive exam ! At Black Hills Area Dental, Dr. Samuelson will help you to feel great about one of your most valuable assets – your smile! 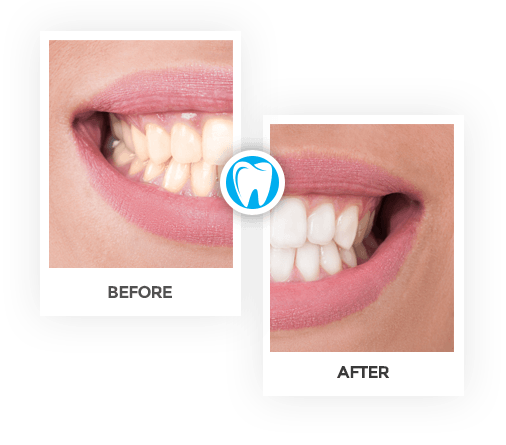 Our doctor uses modern technology and state-of-the-art equipment to help you achieve your goal of having a beautiful, healthy smile. 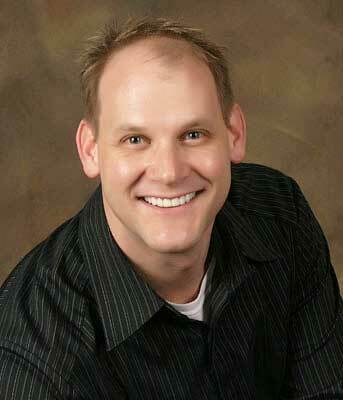 Dr. Samuelson has been practicing in the Black Hills area for many years, and is well regarded for his services. Services offered include family dentistry, cosmetic dentistry, crowns, dentures, partials, braces, orthodontics and dental implants. 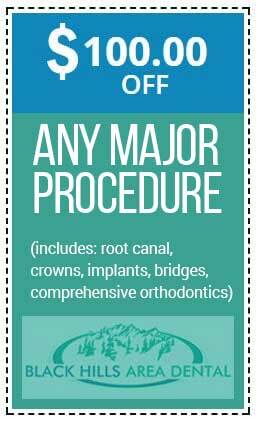 Many of their services – including crowns – can be completed in a single visit! Let our team exceed your expectations and help you get the smile you’ve always wanted, maintain your oral health and provide you with quality dental care. We are always accepting new patients at our office. We invite you to read our Google reviews and see what our patients have to say about our office and the caring treatment we provide. 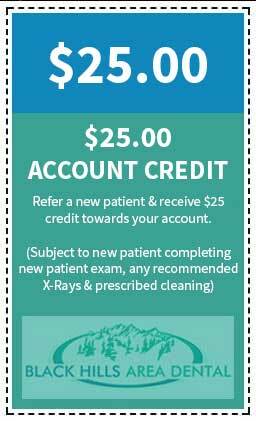 Call today to book an appointment! 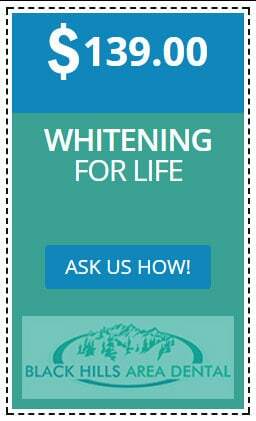 Let us help you create the smile of your dreams and maintain optimal oral health for you and your family. 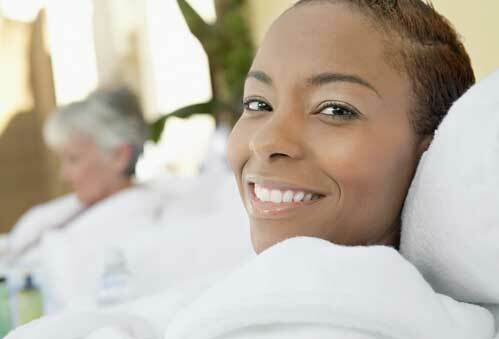 Allow us to give you the smile you’ve always dreamed of. 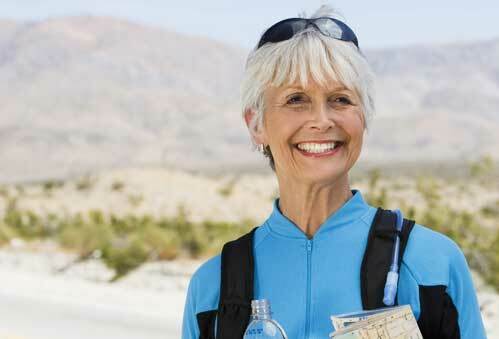 We offer custom-made dentures, implant-retained dentures and individual implant crowns replacing missing teeth. Now you can comfortably eat nearly anything with confidence. Hi! I’m Dr. Bart Samuelson. I’m a dentist in Rapid City providing a full suite of family dentistry, dental implant and cosmetic dentistry services. I was raised in Keystone South Dakota and graduated from Philip High School in 1989. I am committed to my patients, by keeping up to date on the latest techniques and newest technologies. I enjoy all aspects of patient care especially cosmetic dentistry. My professional skills combined with my warmth, sense of humor and abundance of energy help to create a fun and relaxed atmosphere. I invite you to schedule an appointment and allow me to exceed your expectations. Recently decided to make the jump to dentures and the experience has gone above and beyond all hopes. the entire staff is amazing - always willing to help, educate and support you any way they can. Dr Samuelson's dedication and talent far exceeded any dentist i've had before. Sean (who made the dentures) made himself available to be at all my appointments. would recommend this clinic to anyone - especially if you have had a previous bad experience - that won't happen here!!!! Glad he is my Rapid City Dentist!!! Only been to the dentist one time in the last twenty years until I came here. The whole staff from the doctor's on down are as polite, courteous, and friendly as you will ever find. 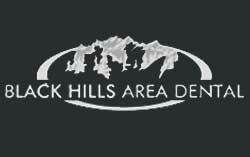 I would definitely recommend Black Hills Area Dental to anyone needing a dentist in Rapid City.